The May 2014 EU election saw the lowest voter turnout on record, according to updated figures discretely released by the European Parliament during the summer holiday period for EU institutions. The updated numbers, published on the Parliament website, show that turnout struggled to reach 42.54% in 2014, well below the 43.1% initially announced. Diplomatic pencils will be being snapped in despair at the lowest public enthusiasm for an EU poll since 1979, when elections were first held. The tweaked figures will also come as an embarrassment for EU officials who had hailed the results of the 2014 poll for finally reversing a trend of declining voter engagement with EU polls. The Parliament in particular ran its entire campaign on an assumption that the economic crisis would boost voter turnout, with the slogan “This time it’s different”. It was, but not in the way that lawmakers expected. Jaume Duch Guillot, the Parliament spokesperson, said on election night that the EU had witnessed “a historical moment because for the first time since 1979, the long term trend of declining turnout has been reversed”. Turnout is seen as a litmus for the EU Parliament’s democratic legitimacy by many but it has fallen steadily, from 62% in 1979 to 43% in the 2009 election. Worryingly for europhiles, the new low will call into in question the legislative credibility of the European Parliament. Guy Verhofstadt, the lead candidate for the liberals and a convinced federalist had initially hailed the marginally-higher turnout estimate, saying the new Parliament “will be more representative than the previous one”. The actual result will also cast doubt on the experiment of having lead candidates – or ‘Spitzenkandidaten’ – campaigning for the major European political families. When the first result was estimated, Simon Hix, a professor of politics at the London School of Economics (LSE) said that it proved “the validity of the experiment to personalise the campaigns and focus them on European issues”. A Parliament spokesperson quoted by the EUobserver news website said the change in turnout numbers was due to differences in estimated and final results for Spain and Italy. Still, the spokesperson put on a brave face: “When you look at the final result and the figure that was estimated at the end of May – those two figures are very close. The final figure, which is a little bit lower than in 2009, confirms that the big descending tendency of previous years has been stopped,” the spokesperson told EUobserver. Turnout did in fact rise in some countries, notably Greece where the sovereign debt crisis and austerity measures imposed by the EU/IMF bailout drove the population to vote en masse. The presence of populist parties with activist bases – particularly the far-left Syriza which won the vote they had billed as a referendum on the bail-out deal – may also have helped turnout there to climb from 52.61% in 2009 to 59.97% in 2014. In Spain, turnout reached 43.1%, lower than the 44.87% recorded in 2009. In Portugal, turnout fell to 33.67%, down from 36.77 in 2009. Ireland saw the biggest drop, to 52.44%, down from 58.64% in 2009. "Our figures were not 'updated' nor 'discretely released' and even less in an attempt to hide whatsoever 'during the summer holiday period for EU institutions', as your headline might be suggesting. First, what we had on the Results webpage until 25 July was our estimate given during the election night - 43.09%. We have always stressed that this was an estimate, based on projections (as some countries were still voting and none had published official results by the time we were announcing this estimate). You might note that the difference between 42.54% and 43.09% is 0.55pp. I would not say that it is 'well below', as you are suggesting. Rather, also given the rapidity with which we were able to give this estimate, we are confident that we were very close to the actual result. Our figures were not 'updated' - we replaced the estimate by the actual result. Second, this was by no means done 'discretely'. Parliament was not hiding the final turnout figure – for the publication of which it has no legal obligation – anyhow. It has always been said that the updates of the voting results would be put on the results webpage as they come and as they are confirmed by national authorities and that the final turnout would be put there as well, when ready. There have not been press releases on the successive updates of the election results nor composition of the political groups either, and nor were there any official press releases announcing these and the EU-wide turnout in 2009. Journalists were informed that all those updates would be published in our special internet pages on the European elections results. As for the timing, we would have wished to publish the turnout figure earlier if this was possible for us. But it wasn’t. The official national figures needed to be confirmed in some cases with the national authorities (which need to wait, in some cases, for complaints or recalculation of some districts before they can confirm the final figure). The Parliament cannot of course publish the final EU-wide figure before the 28 national authorities confirm theirs, which takes some time. The last confirmation reached Parliament's services on 25 July in the morning and following this confirmation, the final figure was put on the website the very same day. Concerning your comment on the Spitzenkandidaten, you might have seen that countries such as Germany and France, which saw an increase in participation – 4,83pp for Germany, 1,8pp for France – were also the countries in which the media coverage of the Spitzenkandidaten was the strongest and the citizens the best acquainted about the process. This is by far the most interesting element of the 2014 turnout and the most political one." 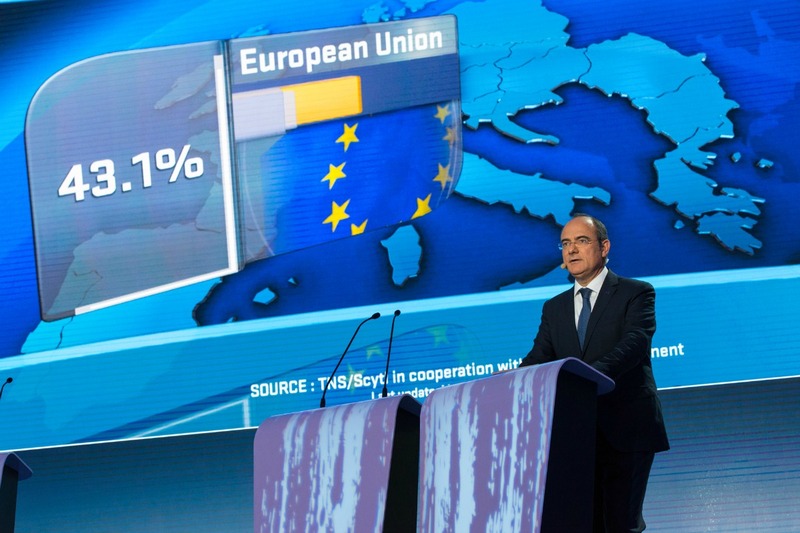 An important factor in the eighth European elections was how many European citizens participated. Turnout for the European elections fell by almost 19 points between 1979 and 2009, from 61.99% to 43%. Trust in the EU has also hit low records in the past years, as has trust in national politics. The European Parliament has conducted a large-scale attempt to boost turnout in the 2014 elections, investing in a social media campaign. The single candidates for the position of the EU Commission President was part of this attempt to spur voters' interest. Love the use of the word “discretely” in the introduction. Of all the hysterical hype put out by the pro federalists immediately after the results my personal favourite was the tweet by Viviane Reding describing the spitzenkandidaten as a “real game changer”. Wonder what she will say now? Indeed will any of those living so entirely in the EU bubble that they are insulated from everyday reality actually deign to say anything to us common folk on this subject or will they just quietly ignore the further evidence that there is simply no buy in to the federalist ‘dream’? We await your words of wisdom Messrs Verhofstadt, Juncker, Schulz, et al, tell us again how you are listening to us and how you will change. Make grand speeches so that we may be enlightened and learn the error of our poor ignorant ways! No doubt we are just too stupid and ill-informed to see the bigger picture. The alternative of course is that you may just be too condescending and elitist as well as personally extremely comfortable to listen to the voice of the people. Anyone want to bet that voter turn out will not slip below 40% next time ? And at what level will the Parliament accept that it has no legislative credibility at all ? a) How someone “not” voting takes away legitimacy from my vote? c) How does exactly the spitzenkandidaten system relate to voter turnout? Conceptually its no different than expecting David Cameron MP to be nominated Prime Minister if conservatives win the next election, independently of the voter turnaround. A)	Given that we were never asked whether we wanted this Parliament to be placed in authority over us and the powers that be still refuse to ask that question, the only way voters can express their view is to refuse to engage, I would suggest and the original article directly implies this. As the EP has failed since 1999 to get a 50% turn out while national elections are still much higher this must demonstrate that it lacks the popular support national parliaments have. In addition as approaching 60% of people refuse to vote despite all the efforts of EP supporters, it directly questions the authority of the establishment. To take your view is to ignore why people are rejecting the institution wholesale. B)	I simply ask the question. If 50.01% vote, regardless of which way they vote, then you can justly claim that the Parliament is representative of the population as a whole. If the figure is 42.54% then that becomes much less convincing, I was just asking at what level it is impossible to make the case, less than 40%, 35% …… ? We might argue forever about the validity of the Parliament, but what supporters must answer is that if people steadfastly refuse to engage despite all the efforts of the supporters then there must be something fundamentally flawed with the entire concept of the institution. Of course you are entirely free to dispute this hypothesis, but you must then explain why so few people can be induced to vote. Here is the key ! It’s clear that people sees it’s no interesting about the Administration of the E.U. ! Commissioner ? What is it ? What do they learn at school ? Nothing about the constitution of the E.U. administration ! If the e.U. had a President as Tony Blair said in 2009 then things of the view of people about the E.U. would be seen differently ! People have in mind the national governance as interests! The E.U. has no federal Budget nor treasury ..nothing at all ! As long as Council exists with 28 ministers on their own with no President at all then i doubt in future there will be no score hit! The above report presents a powerful critique of the deficiencies of the European Parliament. My conclusion from that report is that if you just wanted an assembly to scrutinise EU legislation it would be better to return to the pre 1979 situation of national parliamentarians sitting in european assembly. National politicians are subject to much more scrutiny than EU politicians. The absence of European media means much less scrutiny of EU politicians. This has two key impacts. Firstly NGO and commercial lobbies are stronger at EU level and secondly EU politicians are more euro-federalist than their national parties. Instead of doing what it should be doing, properly scrutinising a limited range of legislation, the assembly spends an enormous amount of time and resources trying to extend its powers. To justify its demand for increased power it promotes euro-federalism by creating a “european identity”. Pro federalist organisations are generously funded, expensive visitors centres, and so on and so on. Unfortunately when sceptics react against the absurd pretensions of the European Parliament they react against the whole idea of co-operation between the countries of Europe. A really interesting link well worth reading. As I know I’M an European !! In your eyes – Am I not an European ? Don’t know why I’m wasting my time typing this but! Mr, Senor, Monsieur, Herr, Sig, Senhor, O k, or whatever. Since there is no country called Europe what nationality does it say on your passport @an european? Thats assuming you have one. But having read your pro Eu drivel for two years or so I don’t expect anything but more of the same clap trap from you. And if you dislike the British so much why are you here and still posting? Troll maybe………….. But Europe per definition is the continent for European citizens ! Yes we are E.U. citizens as even how much you may want to undermine this ! Still posting ? Because Euractiv is an European press ! And yes I have no problem at all with my federalist feelings! Do you think I’m ashamed ? There are the self-only interests and the common or unified interests ! I’m for the common interests and again here I’m not ashamed ! Either one federal economy with Solidarity or full back to the past in 1939 ! Why not ! If nothing happen in the coming years I will support every far right winger to dismantle this kind of insolidarish Europe with multiplex borders control with snipers ! Maybe It’s your English clap trap against mine ! But firstly your referendum is next the door and I of course will have a nice support to you ! I can only assume you come from one of those ‘Charity’ countries thats only in the EU for what they get out of it, you know Poland, Bulgaria, Romania, Greece, Spain, Portugal. Shock horror one day your country, where ever it is, will be called upon to PAY ITS WAY! and give more in to the EU than it gets out. Giving your ‘Solidarity’ money to someone else at the cost to your own people. Then come back and speak to me. I suggest your common interest is nothing more than a smoke screen. But like most cowerdly EU Federlist you never give your own country of birth, hiding behind this non country you call Europe. A pox on the EU and all its supporters!! @an european, you are very much a French person and you should be proud to be so. Bear in mind that Europe takes in part of Turkey and a lot of Russia, so being ‘European’ is meaningless. On the other hand, if it makes you happy crack on. I am of course a well known “Trekker” and a bit of an Alien. It’s clear that you’re an Ukip actor and brainly high-underminded to understand it ! @A Londoner, really good link. It really makes a lot of sense. In fact it looks very much like Boris has quoted it in his speech. that’s if you can see it! Austerity, liberalisation, posted workers, Frontex for you, but not for me… said the EU official and laughed his/her way to the bank (and his holiday home). Clearly you feel yourself to be European so the concept has some meaning. However, I have difficulty in seeing the boundary between “European” and “non- European” since many of the things we value – rule of law, parliamentary democracy etc are valued by countries thousands of mile from Brussels. I also think that questions of identity are irrelevant to many of the benefits of European co-operation. For many issues such as air traffic control, air pollution, linking of transport and power networks etc etc, the need arises because of geographical proximity not shared cultural values. This kind of question – Of an powerfully strong Continent or Country with countries in it – I already explained it and I support a federal economy (financial system with a Treasury only ) similar to the U.S. and not a for every own a selfish one ! Rising economy with much lesser jobless – that is what we need ! Either unite or dismantle the E.U. totally and ban all advantages of every every european country ! It’s official: Last EU election had lowest-ever turnout. So just what is the damned EU’s relevance to the ordinary citizen? In the last 12 months it nearly precipitated a war with Russia due to its competence. It continues to permit mass immigration of elements hell bent on the destruction of western culture. what would the turnout have been for EU elections on their own? @lighthouse – that is a very interesting site if a bit difficult to follow at times! So many MEPs are infected with the eurofederal virus and prefer to speak on the big issues even if they have no powers over them rather than bothering with tungsten lamps. The lobbies seem to benefit from the absence of too many inquisitive journalists in Brussels. Having to register as a lobbyist in Brussels makes it much more difficult for the Sunday Times to mount a sting operation against corrupt MEPs. At Westminster if an MP is approached by a lobbyist offering to buy a favour he or she can never be sure that it is not a journalist. In Brussels the register protects MEPs. Interesting and ironic point – a seemingly tighter EU registry of lobbyists presumably for good intentions, also meaning it is more of a closed circle. It is my belief that the nostrum of most of the EU’s problems is concealed in the educational system. If something is not working properly, it is only logical that you go to the source of the issue. Students in their penultimate and final years at High School (or College, or whatever..) for example are most susceptible to influence coming from the political world – they are about to become adults and gain the right to vote but their knowledge is mainly limitted (at first) to what their parents tell them. If you want people to care more about European Parliament elections, they need to know more about how its decisions affect them as citizens. But this cannot happen when the regular person has no idea what the EP does, what it means in financial terms to vote for a political party at national level to send its members to work in Brussels and Strasbourg, or how the EU functions at all. Such level of awareness, however, cannot be achieved without a focused strategy. And its emphasis has to be put on those to come. I still cannot understand why education is not among the shared competences of the EU and the MSs. I may have understood the political incentives for its exclusion in the past when the EU had not been such a heavy regulator, but such strategy is no longer compatible with its current objectives. If sustainable growth and European integration constitute some of the guiding principles of the EU, what political incentive is there not to educate penultimate and final year students in European affairs, since they are either way on the verge of entering ‘the real world’? And I am not talking about some propaganda. It is actually quite simple. There is already a discipline called “History” in schools. Why not include “Modern European History” as part of the compulsory topics that are studied? In Bulgaria, for instance, the subject History stops at WWII. The socialist times are excluded, which leaves a 60-year gap in the cultural knowledge of the students. As a matter of fact, in Belgium elections are obligatory. If there are other such countries in the Union, the real percentage could have been even below 40.